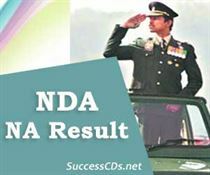 NDA Result 2018 - UPSC NDA/NA Exam II 2018 Final Result has been declared by the Union Public Service Commission (UPSC) on its official website. 447 candidates have qualified for admission to the Army, Navy and Air Force wings of National Defence Academy for the 140th Course and Naval Academy for the 100th Indian Naval Academy Course (INAC). Utpal Anand is the Topper. UPSC will release the marks of the candidates after 15 days. The final result is provisional and subject to submission of documents supporting Date of Birth and Educational qualification of the qualified candidates.